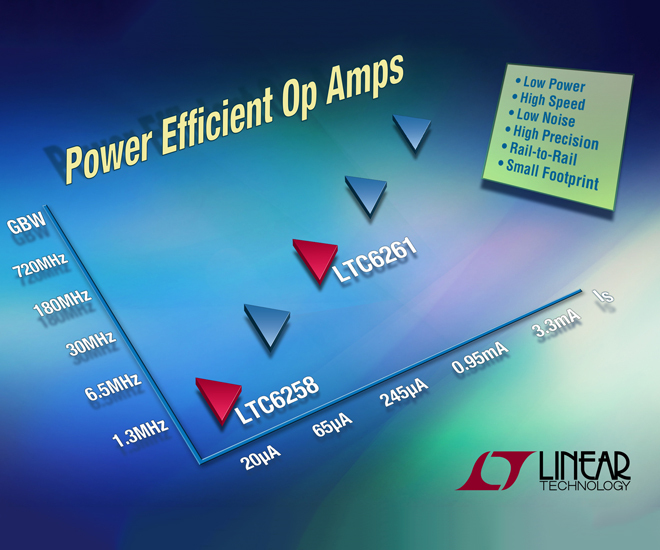 Linear Technology’s op amps feature current supply range of between 20µA to 240µA per amplifier. Linear Technology has extended its line of low noise, precision operational amplifiers with the addition of the LTC6258/59/60 and LTC6261/62/63 single/dual/quad op amps. The new devices operate on 1.8V to 5.25V supply, feature rail-to-rail inputs and outputs, and include versions with shutdown mode, according to the company. The devices are fully specified over the industrial (I) (–40°C to 85°C) and extended (H) (–40°C to 125°C) temperature ranges. Input offset voltage is just 400µV max. With supply current of only 20µA per amplifier, the LTC6258/59/60 achieves 1.3MHz gain bandwidth product and 240V/µs slew rate. They include input EMI filters that provide 45dB rejection at 1GHz. They are stable for any gain and with any capacitive load. Meanwhile, the LTC6261/62/63 achieves 30MHz GBW product and 7V/µs slew rate, drawing just 240µA per amplifier. Wideband voltage noise is just 13nV/√Hz. They are stable for any gain and for capacitive loads up to 1nF, according to Linear. The single LTC6258 and LTC6261 are available in 2mm x 2mm DFN package like the dual LTC6259 and LTC6262 as well as 8-lead SOT-23, MSOP-8, and MSOP-10 with shutdown mode. The quad LTC6260 and LTC6263 are available in the MSOP-16 package. Figure 1: Power efficient precision op amp family extends from 20µA, 1.3MHz to 3.3mA, 720MHz.